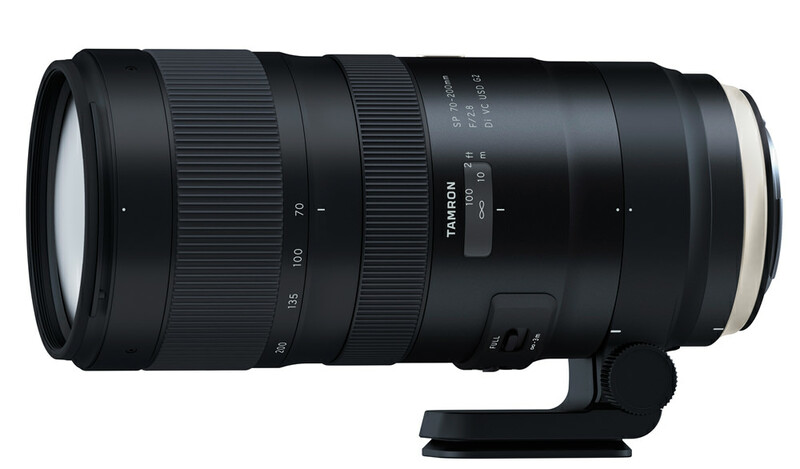 Tamron have announced a new 70-200mm f/2.8 Di VC USD G2 lens model. Tamron has announced the launch of the SP 70-200mm f/2.8 Di VC USD G2 (Model A025), a new telephoto zoom lens product for 35mm full-frame DSLR cameras. It's an update to the SP 70-200mm lens released in 2012. This new model has been developed by substantially enhancing the features of its predecessor. These include a thorough review of the optical, mechanical and electronic designs to enhance increase autofocus speed and precision, reinforce VC (Vibration Compensation) functions and to shorten MOD. New features include eBAND Coating, Moisture-Proof and Dust-Resistant Construction, Fluorine Coating and compatibility with teleconverters. The lens design features a metal-based barrel for improved handling and ease-of-use. The result of this dramatic evolution is Model A025, a high-speed telephoto lens that widens the scope of expression for photography in a broad range of genres, such as portraits, landscapes, sports and photojournalism. The lens is set to be available from the end of February 2017. No pricing has been announced as of yet. Also announced is the Tamron 10-24mm ultra-wide-angle zoom. Based on the current model (A009), the optical design has been revised and improved. Both the resolution and contrast reproduction performance far exceeds the present levels. Bokeh has been enhanced and expanded to deliver outstanding background effects across the entire zoom range. Use of a circular diaphragm with nine blades further improves bokeh. The optical design of the new lens consists of 23 elements in 17 groups. Optimum deployment of XLD (eXtra Low Dispersion) and LD (Low Dispersion) glass elements thoroughly eliminate chromatic aberrations, which tend to become particularly prominent in high-speed telephoto lenses, across the entire zoom range, while ensuring uniform, high-level image quality even on the periphery of the image plane. Also, the VC system of the new lens offers three VC modes, including one mode exclusively for panning. Photographers can freely choose between the different VC modes according to the shooting conditions. Even for telephoto shooting in low light, which tends to be severely affected by camera shaking, photographers can now enjoy jitter-free handheld shooting with much greater flexibility. VC MODE 1 - standard mode that strikes a great balance between the stability of the viewfinder image and the stabilization effects. This new lens is equipped with a USD (Ultrasonic Silent Drive) ring-type ultrasonic motor, whose outstanding responsiveness and control ensures accurate high-speed focusing. Incorporating two advanced, high-performance microcomputers and optimizing the algorithm has improved both the focusing speed and accuracy compared with SP 70-200mm (Model A009). Additionally, thanks to the Full-time Manual Focus override mechanism, photographers shooting with AF can instantaneously make fine focusing adjustments using MF without wasting time by switching the AF-MF mode back and forth. The new lens features Tamron’s original eBAND (Extended Bandwidth & Angular-Dependency) Coating, a technology that combines a nano-structured layer with an extremely low refractive index with the conventional multiple-layer coatings. Optimized and exclusively designed for this new zoom, the eBAND Coating provides superior anti-reflection performance, effectively reducing any flare and ghosting. Even when taking backlit portraits, the new lens delivers flawless, crystal clear images. For the SP series products in particular, Tamron has established rigorous design and quality standards. These standards apply to the optical design, mechanical design and the cosmetic appearance. The optical design has been refreshed, mechanical parts improved and a new exterior design adopted. To maximize the optical performance intrinsic to this product, Tamron has improved the accuracy of the component parts and increased the precision of the overall zooming mechanism. Does anyone know if Tamron will be making a Sony A Mount version?